It seems incredible that White House aides would schedule the first U.S.-Russia summit of the Donald Trump Presidency for the day after the World Cup final soccer match in Moscow, given the assiduous attention to detail that has, historically, governed every meeting between the two superpowers. Amid constant pop culture chatter of an illicit Putin-Trump “bromance,” coupled with an FBI investigation into possible collusion between Russian operatives and members of the Trump 2016 Presidential campaign, the timing of the event is just another sign Trump’s people don’t care to make Putin look good. Or they don’t understand the various ways they do. As a historian of Russia specializing in Kremlin media strategy, I see confirmation of a Putin public relations victory in headlines around the world. The summit is taking place just as the World Cup has, to quote one German news magazine, “shown Russia in a new light.” For the past month, Moscow has been able to advertise itself as more international, not to mention more welcoming of foreigners, than Washington. 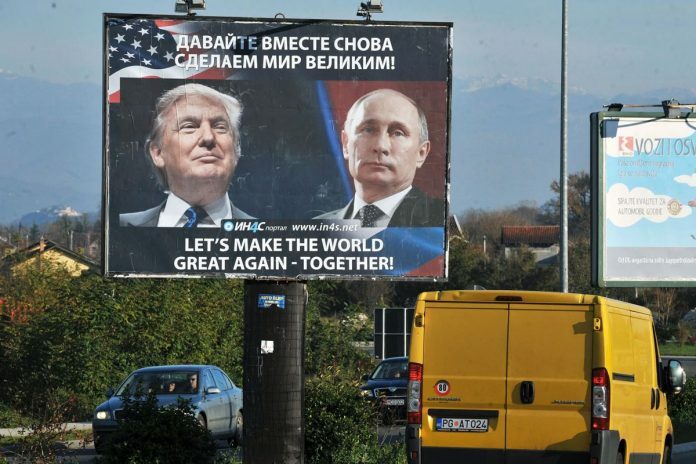 Above all, the summit with Trump created an opportunity for Putin – even as he refers to the U.S. president with ostensible respect as a “good, tough entrepreneur” – to widen a growing divide between the U.S. and Europe. French President Emmanuel Macron meeting with Putin at the World Cup Final only underscored how western European countries are reevaluating their relationships with Russia. Germany and France in particular have long warned of Kremlin-sponsored efforts to destabilize Europe and undermine liberal democracy. But over the past year, they’ve also grown increasingly upset about what they claim have been U.S. attempts to use sanctions against Russia to promote U.S. economic interests at the expense of European companies. Trump only added to the growing hostility when he kicked off a week in Europe by insulting Germany over a Russian pipeline deal and demanding NATO members start paying their own way. “I’m sure that the overwhelming majority of people who visited here will leave with the best feelings … and will come again many times,” he proclaimed. Such positive soundbites can obscure darker realities of how power works in Russia, including the censorship that boosts Putin’s prestige. For example, one sports commentator who jokingly mentioned the name of dissident Alexei Navalny while on air suddenly disappeared from further World Cup coverage. Nevertheless, global footage of cheering crowds across Russia have, for weeks, have posed a stark contrast to pictures shared around the world and in Russia of U.S. immigration authorities separating children from parents at the Mexican border. The summit allowed Putin to highlight this ostensible contrast between his presidency and that of Trump’s. Russia’s state-controlled media, once a champion of the U.S. leader, now tends to damn him with faint praise, holding up Putin as a counterexample of stability and strength. “Comedy Club,” a popular show on one of Russia’s several government-funded television channels, featured sardonic skits between Trump and Putin impersonators in which the Trump figure is always at the mercy of the wily Russian. The U.S. leader cowers when the Putin actor jokes he owns a jet plane “that can fly to America in a single second.” The faux Trump then orders all the Mexicans in the U.S. to be sent to a city he mistakenly believes Putin might bomb. These images present Putin and Trump as powerful equals, the only men necessary to shape a new and improved global order, in which other nations would seem to play only an auxiliary role. But they also show Putin as more farsighted than Trump, calling attention to the narrowness of the latter’s “Make America Great Again” election slogan. These purported contrasts between the two leaders are meant to resonate with Europeans, horrified at Trump’s apparent disregard for international cooperation. Trump’s recent decision to levy tariffs on steel and aluminum imports from the European Union as part of an ostensibly China-focused trade war has also enraged Western allies – to the benefit of the Kremlin. “Trade War: Is Trump driving Europe into Russia’s Arms?” ran a June headline in the German newspaper Die Welt. German Chancellor Angela Merkel recently urged NATO to refocus on the danger of Russian aggression toward member states in eastern Europe. But she also met with Putin in Sochi in May to discuss ways of improving economic ties. Putin at the time greeted Merkel with a bouquet of roses. Trump, in contrast, arrived in Brussels only to berate the German Chancellor, implying that Merkel – not he – was under Putin’s thumb. “It’s very sad when Germany makes a massive oil and gas deal with Russia when we are supposed to be guarding against Russia,” he proclaimed. At the same time, Trump has avoided any critique of Putin and even predicted that his one-on-one with the leader “could be the easiest” of his week-long tour. Such apparent double standards help keep the Putin-Trump illicit “bromance” story alive. Yet Trump seems blithely willing to dismiss any negative media coverage as “fake news.” His off-the-cuff comments praising the Russian leader play into conspiracy theories at home, while offering Russians innumerable chances to showcase U.S. stories accusing Trump, rightly or wrongly, of incompetence and wrongdoing. This way, the Russian press can highlight Trump’s weakness, even while seeming to rise to his defense. One example: RT coverage of a video posted on the New York Times website, portraying Trump and Putin as lovers, which the Kremlin-funded outlet indignantly condemned as homophobic. Similarly, it ridiculed a July cover story in New York Magazine entitled “Prump Tutin” claiming that Trump has been a Russian agent since 1987. In such a setting, Russia wins. The summit ended in failure, the Kremlin blames U.S. Russophobia and is focusing on cultivating closer European ties. Putin emerged as triumphant statesman with verbal agreements that only Putin and Trump know. Meanwhile, any deals Trump tried to make – even in regard to Syria and Iran – will be capitulating to a tyrant he has too long failed to condemn. Cynthia Hooper is Associate Professor of History, College of the Holy Cross. This article was originally published on The Conversation.